TheHIPAA Pro Enrollment module parses the information contained in an X12 834 EDI file and stores it in its database. It also displayes the information on a form that can be printed. Integration to an existing system can be done through the ODBC compliant database or through manual data entry. 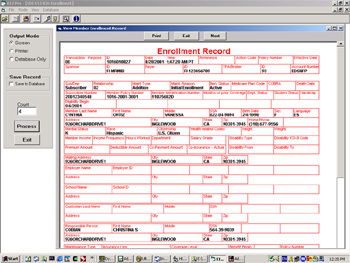 The enrollment information is either displayed on the screen or printed on paper. The information can also be saved to a database. Records are accessible through ODBC and can be retrieved through any database application such as Microsoft Access.